Madison Pruitt was made an honorary officer by the Chicago Police Department on April 6, 2016. 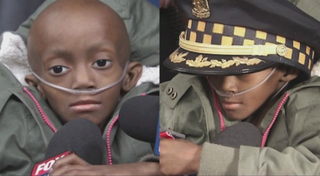 A 6-year-old Chicago girl died from a rare form of cancer over the weekend, just days after being honored by local police, who presented her with a badge, a uniform and a medal of valor, the Chicago Tribune reports. Madison Pruitt died Sunday, a year after she was diagnosed with rhabdomyosarcoma, a rare muscular cancer. Just Wednesday, Madison, who had always dreamed of becoming a police officer, according to family, was surprised by some 70 officers from the Chicago Police Department, including interim Police Superintendent Eddie Johnson, who welcomed her as the department's newest junior police officer. Madison was showered with tokens, including a police officer's hat, certificates of recognition, a police shirt, a badge and a baton. One officer gave the young girl a medal of valor that he had won. The ceremony was meant to take place at the police station, but Madison was not feeling well enough to make the three-block trip. However, the officers were more than happy to trek down to the little girl instead, Sgt. Ernest Spradley said. "When a little 6-year-old girl says she wants to be police, that kind of restores faith, even in our profession, because there are little boys and girls who want to grow up and who want to do what I do because it's a noble profession," Spradley said.